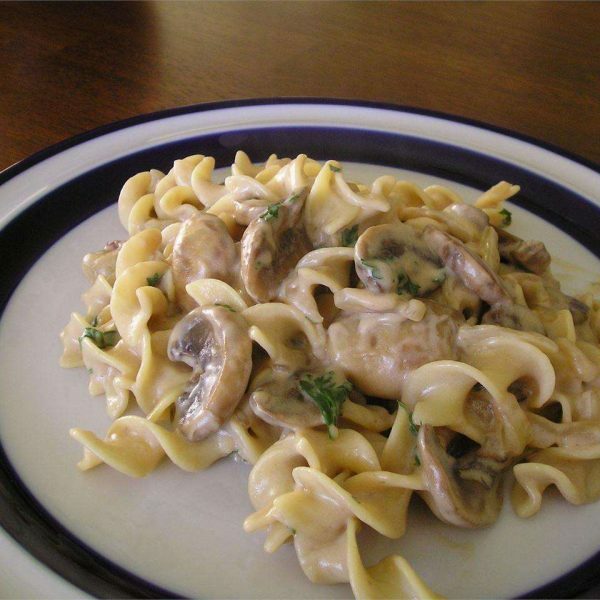 Onions and mushrooms are cooked in butter, then tossed with soured cream and vegetable stock to make a creamy sauce for pasta or mashed potatoes. Cook egg noodles according to packet instructions. Remove from heat, drain, and set aside. At the same time, melt butter in a large heavy frying pan over medium heat. Add onion, and cook, stirring until softened. Turn the heat up to medium-high, and add sliced mushrooms. Cook until the mushrooms are limp and browned. Remove to a bowl, and set aside. In the same pan, stir in vegetable stock, being sure to stir in any browned bits off the bottom of the pan. Bring to the boil, and cook until the mixture has reduced by 1/3. Reduce heat to low, and return the mushrooms and onion to the pan. Remove the pan from the heat, stir together the soured cream and flour; then blend into the mushrooms. Return the pan to the burner, and continue cooking over low heat, just until the sauce thickens. Stir in the parsley, and season to taste with salt and pepper. Serve over cooked egg noodles.